This is a bottom fishing excursion where you will be fishing at depths of 100 - 300 feet for rockfish, cod, and halibut. This trip is not just about fishing but experiencing Alaska in a very eclectic and personal way and is a wonderful way to introduce children to Alaska Sportfishing. The excursion is normally operated in our 20 ft. Open air skiffs that accommodate a maximum of five guests and fish with an average of four fishermen. After fishing for three to four hours, you will arrive at our remote campsite and dine on a delicious bouillabaisse paired with your catch of the day. Our campsite allows access to Ketchikan’s old growth forest and rocky beaches for exploration before and after your meal. Baranof Fishing is dedicated to helping our guests Cook their Catch and enjoy fresh Alaska Seafood. 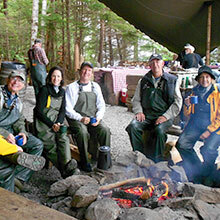 The wilderness setting of this tour is a wonderful way to enjoy your fresh Alaska catch.